There are three little words that I find so comforting. For me, it's almost like that sentence is the closest a sentence can get to a hug from someone you trust wholeheartedly. 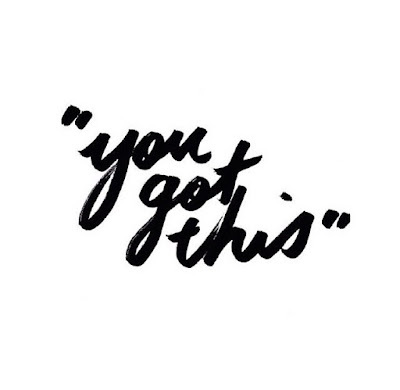 We're not talking about 'I love you' - we're talking about 'you got this'. About a year ago, I had to catch a train the following morning and I felt simply... unable. Technically I was 'able' - my condition is at a point where, from time to time, I can physically walk unaided and despite travelling by train being incredibly hard for me still, it isn't the completely impossible notion that it once was. Anyway, I was feeling overwhelmed by that extreme difficulty I'd be facing upon awakening and was also in a very 'I. Cannot. Do. It' mindset. It's not a mindset that I often find myself in but there it was, and I had no confidence left in my body's ability to get itself home. When the morning arrived and the time came to get a taxi to the train station, my goodbye with Will ended with an enveloping hug and a "you got this" in my ear. It was a tiny thing but it was also an important thing that I really, really needed. It was the important, comforting thing that I wanted to hear and I stopped thinking 'I can't' and started thinking 'I so can'. I haven't heard it since, but perhaps that's because I'm able to tell it to myself - and if not, Will seems to have an inbuilt "you got this"-sensor. To be honest I can't even remember that particular journey so it must've been alright - I'm sure my body felt completely and utterly broken as it does on a daily basis, but I did it. I made it when I was sure I couldn't, and I wanted to share that with you today. 'You got this' applies to countless situations, I feel. It's not saying 'just do it', it's saying 'however long you need and whatever roads you need to take, it's fine - you'll get there, and you're stronger than you know'. Whether you're leaving your job for a new one, getting out of a harmful relationship, bringing up a child, starting a blog, coming out to your family, waking up to fight your chronic illness another day, attempting to get the wings of your eyeliner even, about to sit an exam... it's always relevant. Meg you were such an inspiration thanks for sharing your story! Meg, thank you for sharing it! I think this was belief is for me - not about particular thing, particular date, but about the whole. That whatever and how long it would take, it's possible. Maybe even not in the form I see it, but it's possible. Though in three words - three so content words. Such an inspirational post Meg, you've got this! This is such an inspirational and much needed post Meg. Wow, I really needed to read this today. I was originally diagnosed with M.E when I was 15, but have struggled with my health my whole life and more recently have started to accumulate other serious and life changing diagnoses. Over the last year my health has nosedived pretty spectacularly and for the first time in a very long time I feel terrified of what my future is going to hold (or not, as the case may be). I'm pretty much at an all time low and am at the point where I feel like ending my life is the only way to escape this pain, but reading this post has just given me that little lift to keep me going another day. Thank you.